Today's the big day, and Apple finally revealed its new iPad Air and new iPad mini 2 with Retina display to the world. But in typical Apple style, it began the day by tooting its own horn a bit, revealing some impressive adoption numbers for iOS 7. 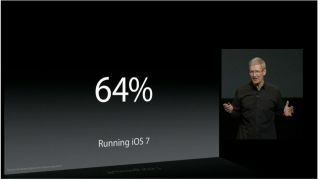 Apple CEO Tim Cook revealed that 64% of iOS devices are now running iOS 7, with 200 million devices downloading the OS update in the first five days. He also reported that there are now over a million apps in Apple's App Store, with a total of 60 billion downloads and $13 billion (about £8b, AU$13.4b) earned by developers. "When we see customer response like this, it makes all the hard work worthwhile," Cook said. The latest iOS update was the most significant change we've yet seen to Apple's mobile operating system, adding a bevy of new features with a totally redesigned look. But this news was just the tip of the iceberg for Apple's today. The company kicked off with a video showcasing its strategy and values - namely, creating "the very best products in the world," Cook explained. They also touched on the new iPhones revealed last month, showing a dramatic video about their launch in Apple Stores around the world. But the most important news of the day was the unveiling of Apple's new iPads, the iPad Air and the iPad mini 2 with Retina display. The iPad Air is thinner and lighter than its predecessors, but still manages to be more powerful. The iPad mini 2 with Retina display has - as the name suggests - a crisp new Retina screen, and retains all the advantages of the smaller brand of iPad.